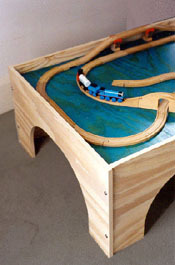 This was the first train table design from Arch. Light. It's a stylish table of pickled pine plywood with a turquoise aniline dyed top. 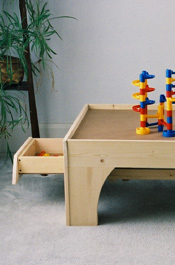 Can be constructed with or without built-in drawers. BUILD ONE with PLANS from Arch. Light! The second unique design from Arch. Light. Constructed from readily available and easy to work with pine boards that require no edge banding. The latest design from Arch. Light. 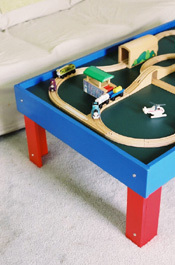 Simple construction with painted pine boards makes this the easiest to build. Can not be constructed with built-in drawers.